Kentucky State University, in partnership with the Federal Reserve Bank of St. Louis, will host an award-winning author, producer and journalist as part of an ongoing annual series of compelling speakers. Georgia Dawkins, author of “Everybody Knows: The Power of Being in Position,” and former local news and talk show producer, will speak at Kentucky State University Tuesday, Nov. 27 at 11 a.m. in David H. Bradford Hall. The public is invited to attend. Dawkins is now creating original content as chief executive officer of Georgia Dawkins Media and is committed to empowering communities through media. According to her biography, Dawkins was previously a producer for “Sister Circle Live,” a daily talk show on TV One. In that job, she produced the show’s pilot, developed the show’s digital strategy, and shaped several of the show’s key segments. “Sister Circle Live” reaches 65 million homes every day. Dawkins spent 10 years in news production and reporting. She started her career while still in college, serving as a desk assistant for ABC News’ “Good Morning America.” She served as a television news producer in cities including Tallahassee, Fla., Fort Myers, Fla., Shreveport, La., and Tampa, Fla., all before reaching the age of 28. In 2012, she was tapped for Gulf Shore Business magazine’s 40 Under 40 regional leadership award. She has served on the boards of the National Association of Black Journalists (NABJ) and the Journalism and Women Symposium. 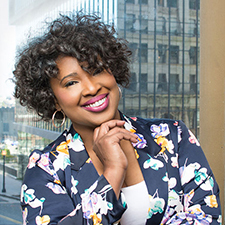 NABJ recently honored Dawkins with the Outstanding Literary Work award for her debut book, Everybody Knows: The Power of Being in Position, at the annual convention hosted in Detroit. Dawkins has a Bachelor of Arts degree in broadcast journalism from Florida A&M University. She also serves on the board of directors of the School of Journalism and Graphic Communications’ Board of Visitors, where she helps guide the curriculum for future journalists.